If you're walking through Boston during a downpour, make sure to keep your eyes on the pavement. You might just see a poem appear before your eyes. Bostonians wandering the city streets in the rain may have come across poems. They are written on the sidewalk. Titled "Raining Poetry," this art installation was a collaboration. It was between the nonprofit Mass Poetry and the city of Boston. The first poems were installed to for the start of National Poetry Month. Several more were added since then. They were created using stencils and a water-repellant spray. The poems are invisible during dry, sunny weather. But they appear like magic once raindrops start falling from the sky. That is according to Aria Bendix. She writes for CityLab. "We want to bring poetry to the people," said Sara Siegel. She is program director for the nonprofit Mass Poetry. She spoke to Bendix. The poems were chosen by Danielle Legros Georges. She is Boston's poet laureate. They include written works by artists like Langston Hughes, Gary Duehr, Barbara Helfgott Hyett and Elizabeth McKim. The poems are scattered throughout the city. Georges selected the poems based on their relationship to Boston. Another factor was their general themes of water and rain. This is according to reporter Cristela Guerra. She works for the Boston Globe. The poems were installed by members of the Mayor's Mural Crew. It is an organization that introduces young artists to the process of creating public art. The Mural Crew uses a biodegradable spray. They also use simple cardboard stencils. 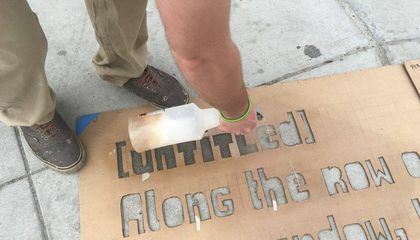 The poems can be fixed to the sidewalk in minutes. The writing should wear away in six to eight weeks. 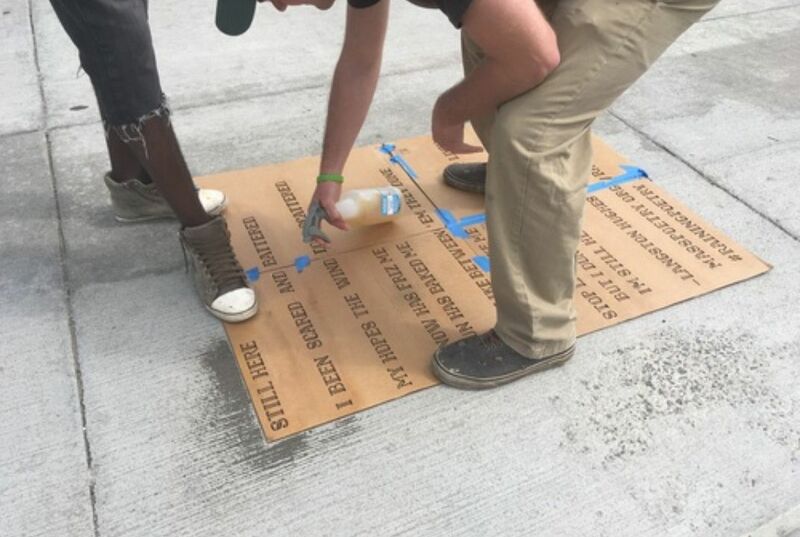 The city of Boston and Mass Poetry plan on carpeting sidewalks with more poems. "It's a public art project. They are meant for everyone," Georges said. "I think this is a wonderful way to bring poetry to the people." The poems appear throughout the city. They are in neighborhoods from Hyde Park to Roslindale. All of the poems currently installed are written in English. But Siegel hopes to add new ones in the many languages that are spoken throughout Boston. These include Portuguese, Haitian Creole and Spanish, Guerra reports. So if you're out and about in Beantown the next time it rains, keep an eye to the ground. You might just spot a poem. It could be glistening under the raindrops. They want to only put it in rain because it make rain more fun. They want to make it "magical". So when it rains it is more fun. They also want to expand poetry. "It is for the public to see" said Goerges. They want the poems to appear raining to make it fell sad. They like the poetry that thay found on the Ground.thay like it cus it different.thay like it cus it not random.thay are creative and nice.it look like other work from other people. They write poems. They write it in the rain. And also because like poems a lot. They want to bring poetry to people. The poems talk about nature. They also talk about calm things. They probably want there there poetry's in the roman rain because maybe it stands out more probably it tell how you feel. When it rain people draw on box. Because it rains. What why they draw on boxs . The first reason why the artist only want their poems to appear when it is raining is beacuse it is fun and unusual to write like that. Another reason why the artist only want their poems to appear when it is raining is beacuse it is a public art project. A third reason is because it is a way to bring poetry to people. They think it will be a good idea to because for the people walking down the streets see the Poem they could encounter a poem that they see.